When John Boruchin was 12 years old, he attended a speech delivered by Zionist leader Ze'ev Jabotinsky. Inspired, he said then, "If I ever make any money, it will go to Israel." Eighty years later, when he passed away at the age of 92, he bequeathed $72 million to JNF and made good on his lifelong pronouncement as a lifelong Zionist. This estate gift helped the organization achieve a record-setting annual campaign year of $121 million, the largest campaign in its history. "John and Dora had a long-time commitment to JNF; from childhood till death," said JNF CEO Russell F. Robinson. "Over the years they funded water and Zionist education initiatives and our Blueprint Negev campaign. Fifteen years ago he and his wife Dora sat with Matt Bernstein, our Chief Planned Giving Officer, and said they wanted to take on bold initiatives that would connect children to Zionism and help to strengthen Israel. They wanted to achieve this with JNF as they firmly believed that we would properly manage their money and their wishes. With this trust, JNF will be establishing The JNF Center for Zionist Education and Advocacy in John and Dora's name from which all our programs promoting Zionist education and advocacy will stem." Born in Poland, John escaped and eventually met his wife Dora in Kazakhstan in 1943. Dora's entire immediate family miraculously survived the war due to being deported to Siberia, which occurred after her brother Max (z"l) was reported to Polish authorities for running away with a small Zionist group. The couple then ran away to marry in Russia in 1945 and their son Isaac was born later that year. The family then moved to Germany, gave birth to their daughter Fay (z"l), and then finally emigrated from Germany to the United States. They settled in California, where John had relatives, while Dora's immediate family all went to Canada. Like John and Dora, Dora's family members are active within Jewish National Fund Canada and the Canadian Jewish community. Starting with a chicken farm, John slowly made his fortune in real estate, almost one acre at a time. Eventually he became one of the largest tract home builders in California, yet the Boruchins lived in the original home he built until the day he died. John is survived by Dora and Isaac. "John was always intelligent and hard-working, with a sharp mind that carried him to the end," said Bryan Albert, a nephew from Canada. John and Dora were impressed with JNF's business model of innovation, vision and ingenuity. "The Boruchins saw us as we are-an organization of social entrepreneurs utilizing cutting-edge best practices to operate like a 21st century business," said Robinson. "They challenged us to get others to follow his lead." 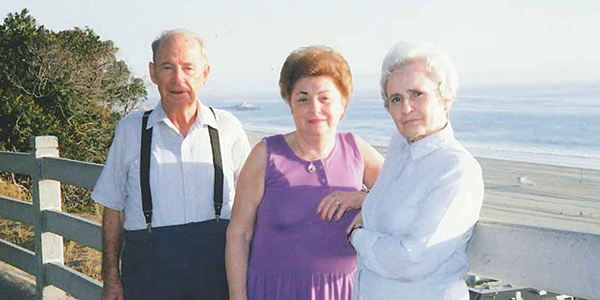 While Israel was always at the forefront for the Boruchin family, John and Dora only traveled to Israel a few times. Partners in both marriage and business - Dora ran the business' office - John and Dora, known as a team to their family, made sure to keep their Jewish identity strong and to never forget where they came from. John now lies in Israel and Dora is still alive, keeping the family's name and Zionist values going. Robinson says, "Through our work we will create transformative change on the ground and in our communities - both in Israel and here in America - keep John's name alive forever, keep our donors' trust, and keep Israel strong." "John's life wasn't about money," explained John's nephew Bryan. "For John and Dora, it was always about keeping their lifelong promise and giving money to Israel. Everything they worked so hard for went to Israel. It was this dedication that truly showcased John and Dora's characters as passionate Zionists."